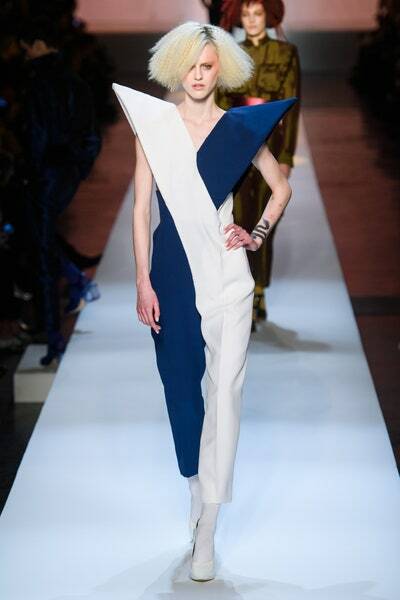 Spring 2019 Balmain Haute Cout.. 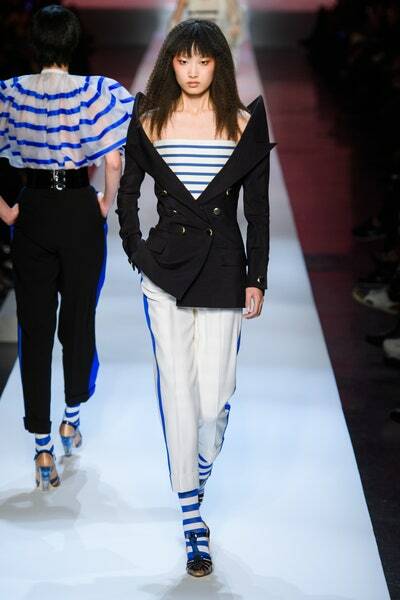 The show launched with new iterations of the iconic Gaultier marinière, first as an airy blouse, followed by a striped taffeta bustier and nautical blazer with “shark shoulders.” This upright, sharp-edged construction was the most consistent element to the collection, resurfacing in Japan. 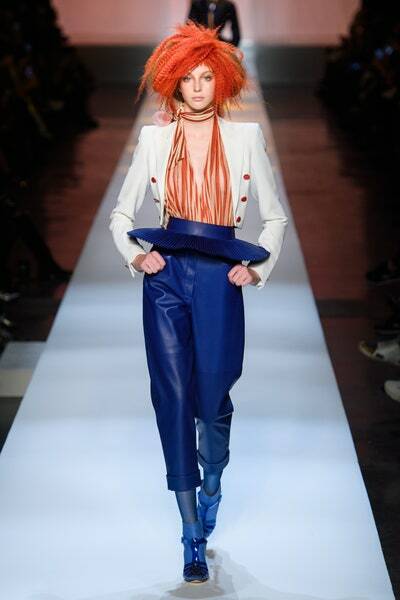 Gaultier dropped signature buoys in the form of pin-striped, trompe l’oeil jeans and fringed cages. 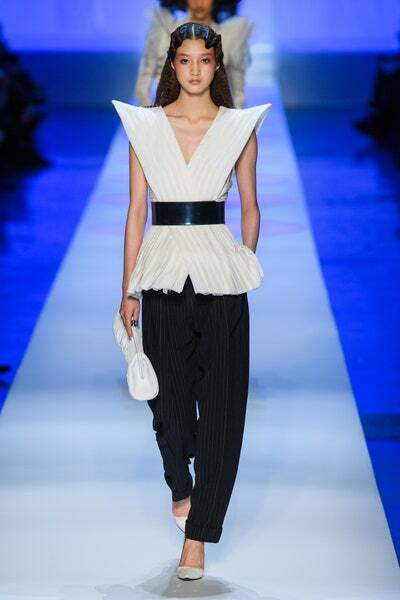 But it was refreshing to see him testing alternative forms—a stiff pleated belt that was half-ruff, half-peplum—whether or not they stick among his clientele. 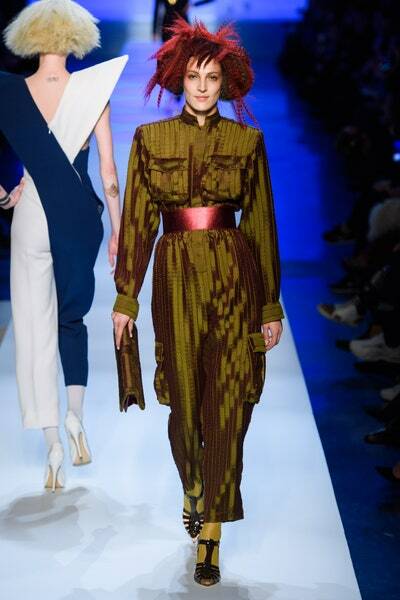 By the same token, many Japanese-inflected treatments weren’t as kitsch as one might expect from Gaultier, though their decorative obi eclecticism would be better suited for the stage than a soiree. Something like the electric green plissé top with black shorts and organza-pleated boots (its Gaultier-given name: Wasa Beach) stood out because its statement was visually direct, chic, and free of thematic bait. 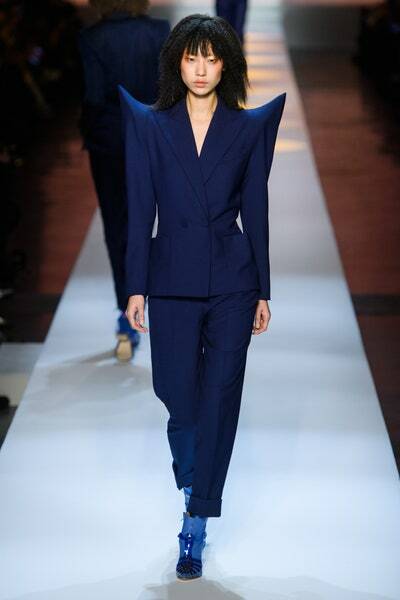 Toward the end, as Dita Von Teese arrived on the runway in a suitably seductive black plumetis gown with “harpoon” sleeves, the focus shifted to a series of dresses that showcased the Parisian couture tradition without all the eccentricity seen elsewhere. Perhaps as some sort of cheeky retort, a short pouf-y dress with an ample train of tulle waves was nearly the same periwinkle hue as Lady Gaga’s Golden Globes Valentino gown. Its name: A Seastar Is Born.